POST EDIT RE: MY PERSONAL EXPERIENCE WITH EARTHING: I HAVE STOPPED SLEEPING ON THE EARTHING SHEET. I FOUND THAT I WAS STILL WAKING UP STIFF, AND THE SHEET IS SUPPOSED TO HELP WITH THAT. I AM TAKING A BREAK BUT WILL START UP AGAIN AT SOME POINT. I WILL KEEP YOU POSTED. Earthing pad came today. With volt meter’s black cord plugged into the electrical outlet’s ground port, and holding red cord in hand, my body voltage was 2.5 volts. Then I put my feet on the pad and the reading went down to .07 volts, which is a difference of 35x. Last night slept with the earthing pad under my back, length-wise. It was grounded at the electrical outlet (would be better to be going through wall to be grounded to earth outside because the outlet may have stray mili-voltage from other wires affecting it, so I read). I slept well and dreamed from 10pm to 12 pm. Then found that I had to move the pad because it was sticking to my bare skin every time I tried to move. I moved it down to my lower torso/hip area, this time width-wise. Woke again at 1:30 and was hungry. Had to get up and eat. Took a melatonin. Went back to bed and slept well until time to get up. And sitting at my desk with the pad under my feet, my feet feel a bit tingly and warm, which is nice for bare feet in October. The Earthing book says mark your symptoms’ severity, then again after a week of sleeping grounded, then again a month after sleeping grounded. Okay so I got carried away with those last two. But it’s good to know where you’re starting from. I went camping the other night and I couldn’t sleep a wink (nor could I when we slept in the front yard last week). How could that be when I was on the ground and supposed to sleep so soundly? !…Today I read on the earthinginstitute.com website that your skin needs to touch earth’s skin – like a bare arm or leg hanging out of your sleeping bag. A-ha!! Last night was second night sleeping with foot pad. I put it under my bare skinned back. Slept from 9pm-12pm, at which point I woke up to go to the bathroom. Then put it on bottom of bed so that feet touched it and fell asleep until about 4 or something. Woke to use the bathroom. Then slept again, but feet came off it. Less stiff in morning. No problem bending over to brush teeth. I notice the grounding warm feeling most when I put it under my feet while I work on computer. I feel good. More energy today. I think I was detoxing from the earthing. Now I am raring to go get some firewood. I feel great! High energy. Had to go get a half-sweet café mocha and almonds at Starbuck’s. This is an expensive and occasional habit of mine – Starbuck’s – and one that I do when I’m feeling tired or when I’m feeling happy and energetic. Got sheets! Will sleep earthed tonight – much more so that with that pad. Slept on grounding sheet last night. Slept well. Woke up not stiff. Last night trying to get to bed I had right eyebrow tics, lots, even with a good amount of magnesium. Also some heart arythmias, nothing alarming, just an old symptom. Actually both are old symptoms of mercury being released. Not sure if that’s it. Wonder how mercury-toxic people respond to being grounded. Makes sense that if you connect your body to the earth then your body will more easily repair issues such as toxicity including heavy metals, but don’t know that mechanism. I do not understand how if sleeping grounded is so needed and powerful how come there aren’t more people talking about a healing reaction in the first week or so. Tonight will be my second night sleeping on the sheet. If you’ve not been grounded your entire life of 42 years except for brief beach excursions, and then you start being grounded 12 out of 24 hours, wouldn’t you feel something, either good or bad? I think I am feeling both. Second night sleeping grounded. Harry’s first night. He slept til almost 8am, which is late for him, so that’s nice. I am stiff this am, so is my husband, so the sheets aren’t an instant fix for that. Right eyebrow tic this am. And last night slept well from 10:30pm to 3am at which I got up to eat something because I was so hungry. Then slept right til 7:40am. In fact, I am way stiff. But contributing to that could be my home runs yesterday, barefoot in the baseball diamond with the boys. It’s been more than a week sleeping grounded, and using the foot pad when I’m on the computer. I feel good. More energy. And yet at night when I get in bed I am nice and tired, and fall asleep easily. I am not stiff in the morning. My eyebrow tics have lessened a lot. My mood is good. My sleep is good. I did test the volt meter lying on the sheets compared to not, and again there is about a 35x less body voltage reading when I’m on the sheets. This is with the wire going into the ground port of my bedroom electrical outlet. I would like to instead have the wire go to the grounding rod attachment outside the house and into the ground. This is how the Earthing Institute’s studies were performed. Figured out how to slip the ground wire through the window screen and out to the sandy soil one floor below. They say the ground should be moist but sand is not very moist. Will email them about that. Regardless, I am happy that the sheet is going right to the earth now. Feels more natural. Still sleeping well. Stayed in a hotel for two nights and slept horribly. Didn’t bring sheet or pad. Last night, back in my own grounded bed sheets, slept fantastically. Needed it. Sleeping well still. Forgot to mention that last week I split my one prescription drug that I take in half. This is in preparation to wean off in a month or two, something I’ve wanted to do since I started it a year ago. This prescription is for hydrocortisone, which is for the adrenals, to help with energy. But my goal is to not have to take it. So far so good with the dose reduction! 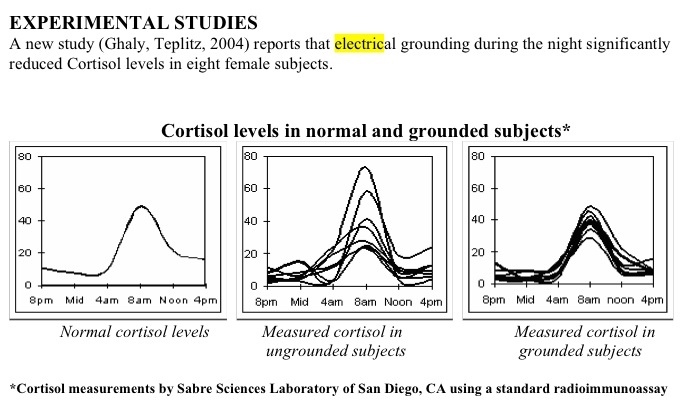 Relevant to this topic is a 2004 study that was conducted on electrical grounding and cortisol levels during the night. He and the researchers found that when 12 subjects with sleeping and pain problems slept grounded to the earth for 8 weeks their night-time levels of cortisol were reduced (which is a good thing) and cortisol hormone secretion was resynchronized more in alignment with the natural 24-hour circadian rhythm profile. This would explain in part why the subjects felt better after the 8 weeks. The chart below is from Clint Ober’s study on the therapeutic effects of grounding. Last night I rechecked my body voltage on and off the sheet. The grounding rod still goes out the window to the sandy soil one story down. 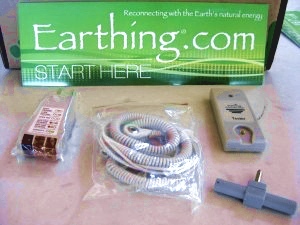 I used the splitter that the Earth Institute sent with the sheet and plugged the ground wire into it. The volt meter’s black lead went into the other side of the splitter. I held onto the red lead, between my fingers. I was off the sheet. It read 1.8 volts. Then I put some bare skin on the sheet and the meter read .1 volts. That’s only a difference of 18. Interesting, because when I used the ground port of the outlet instead of the real ground outside, the difference was 35x. I think that’s because my body voltage is higher when using the ground port; there is no perfect substitution for being truly grounded. The ground port of the outlet just makes an attempt. I look forward to going to bed at night – I get to lie on The Sheet. It feels warming and relaxing when I lie on it. I fall asleep easily. Along with my daily deep breathing and barefoot walks and qigong, life is good! Because it’s been colder lately I’ve been going to bed with clothes on, and I think I can feel the lack-of-earthing difference. Bare skin needs to touch the sheet. In general however, I am still feeling good, just generally up, and it’s due to all of the methods I try to do daily. But because a project had me working late for the last three nights, a couple of them went out the window. I’m eager to start back up with the qigong. And since tomorrow I will be in a hotel, and I will be sure to bring the sheet with me to sleep better. Because I was working on a major project for work, I’d neglected my qigong and my daily walks for more than a week. And I got stiff again! So the sheet is not a panacea for stiffness like I had hoped. There are many causes of stiffness but in my case I think it’s been largely thanks to not moving enough. As of yesterday I’m back on the program. And the earthing pad is still under my feet as I type this. About that question I had re: the earthing rod needing to be in moist earth/sand (I live on an island). I spoke with someone at the company and they said just like when you’re barefoot on the dry earth, conductive contact is still being made between the surface of the earth and the body to maintain the body at earth potential. If the soil or sand is moist however, electron transfer is increased. She didn’t know if wetting the sand would correspond with a lower voltage reading. Another experiment for me to try at some point.